The apartment is part of an ancient typical florentine middle age tower. It is a first floor with one stairway. 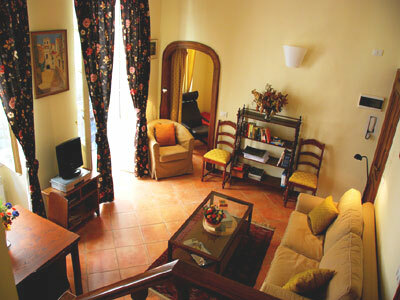 The apartment, recently renewed, is 50 squared meters and can accommodate 5 people. There is a balcony on the back of Palazzo della Signoria with a beautiful view on the musem of Bargello too, and six windows (with shutters). The apartment has got a good taste of forniture, nice pavement recently renewed, heat, air conditioning in the double bedroom, ceiling fan in the living room, tv, cd/dvd player, hair dryer, safe, iron, iron board, telephone available for local calls ( they are included in the rental price), ADSL internet connection ( included in the rental), washing machine, the use of linens and towels is included.